The colourful tale of an old man who fulfils a promise to his beloved late wife by going to visit a geological paradise in South America is shot in 3D. It works fine but the picture would probably be just as entertaining without it. Ed Asner voices the old man, who resembles the older Spencer Tracy, while Christopher Plummer gives voice to the villain of the piece, a mad explorer who resembles latter-day Kirk Douglas. There’s also a kid who looks a bit like the Japanese bloke on “Heroes” and some wonderful creatures including a large bird the kid names Kevin, not knowing it’s female, and a devotedly loyal dog named Dug. Savvy and sharp, the script doesn’t miss a trick and Michael Giacchino contributes a remarkably spry and appealing musical score to match the clever animation. It’s very funny all the way through as we see the loving life of the childless couple whose dreams of a fantasy trip are always thwarted by events before the adventure begins. Once the old man, a balloon salesmen, strikes on a plan to take his house to the skies, it’s up, up and away. Among the clever ideas is one in which a pack of dogs punish Dug by making him “Enter the Cone of Shame”, wearing one of those devices intended to keep pooches from hurting themselves but succeed only in making them look pathetic. The phrase will enter the language on playgrounds and in workplaces everywhere. 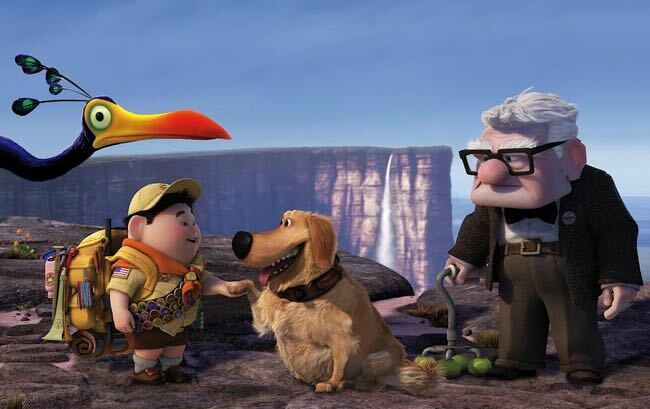 This entry was posted in Comment, Film and tagged 'Up', Christopher Plummer, Ed Asner, Michael Giacchino, Pixar. Bookmark the permalink.